Maren started saying "Mama" about a week ago. Before you start in with the "how sweet" and the "aah"s, I must add that the only time she ever says "Mama" is when she's upset, and the word comes out more as a whine as she seeks refuge from whatever evil her older brothers and sister are trying to inflict on her. For Maren, Mama is refuge. I'm the person she seeks out when she needs something, when she's hungry, when she's tired, when she wants a snuggle. Dada is much more fun to play with, and he sneaks her grape juice. Her big sister Annie will tote her around when she needs to get somewhere, But for this eleven month-old, Mama is where it's at. I don't mean to sound conceited, but Maren isn't the only one who feels this way. When Isaac was in the hospital, he wanted me with him, the big kids wanted me at home with them, and Maren would have surgically attached herself to my hip had it been possible. 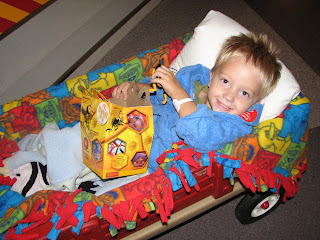 On Halloween night, for example, I ran home to trick or treat with Bryce, Annie and Maren while Isaac was in surgery. I wanted to be back by the time he woke up. I spent the whole time I was home with at least two kids touching me. Annie started sobbing and angrily giving me the 3rd degree when it was time for me to go back. Isaac was awake and asking for me when I arrived at the recovery area. I felt like I was being pulled in a million different directions. Or at least four. A couple of weeks ago, we took my mother-in-law on a drive to the beach. Our van seats seven, and I gave up shotgun so she didn't have to sit between Bryce and Annie in the way back. For most of the trip, each of them had their heads on my shoulders and their hands all over me. In order to get comfortable, I put my legs up on the armrests of the captain chairs in the middle row. Immediately, Isaac and Maren reached their hands out and grabbed my feet. No one told me that I became a magnet when I became a mother, but it's true. All this love--it does something to you. It's a pretty heady thing to be the center of four, no, actually five people's universes. It's also kind of suffocating. Yesterday, when I got done with a 20-mile run, Maren was on my hip, begging to drink from my oh-so-sweaty breast, before I even had a chance to grab a drink myself. Right now she's pulling on my toes, trying to drag me away from the computer desk. But it's also very temporary. These kids, before I know it, are going to grow up, and I'm not going to be their one and only anymore. I love my mom-- she's my best friend now that I'm an adult, but we live more than a thousand miles from each other, and when I look at her, it's not with the adoring gaze I get from Isaac. I'm not telling her every ten seconds how beautiful she is or that she's my very best friend in the entire universe like Annie does to me at least ten times a day. I know that ten years from now, I'll be lucky to have Annie recognize my existence. It's a good thing Eddie will always adore me, because it's going to be a big change to go from idol to pariah in the eyes of my children. Which brings me to the question of what I'm going to do when I'm not so needed anymore. I just don't know. I always thought I'd go back to school and go back to work as soon as my fourth baby was in preschool. I'm not sure that's the right choice anymore. Life feels too full to add a PhD to the mix anytime in the near future. Should I have another baby and prolong the love-fest? Sometimes I think that's the easy way out, because it keeps me in the phase of life that I'm in now-- a phase that's comfortable and familiar, but not necessarily one that's best for the rest of my family in the long run. I want to live a life filled with purpose-- but I can't see what the guiding purpose will be after the next few years pass. In the meantime-- I'll take adoration. After eleven nights, two surgeries, five tanks of gas, one walker, six kids meals from Chick Fil-A, three bees and a mosquito from McDonalds, twentysomething trips to see the trains, a whole parade of doctors and nurses, and about ten viewings of the Lion King, we're finally home. Isaac is doing pretty well. He's still not using his leg much and doesn't have the greatest appetite in the world, but he's much, much better than he was. I don't think I even realized just how sick he really was until he got better and I had something to compare it with. Starting today, I'll be nursing Maren five times a day (I might have weaned her if I had known that we'd be in the hospital so long, which required a LOT of transporting her back and forth-- she now cries whenever she comes near her carseat), and giving Isaac IV antibiotics three times a day. Of course, Maren's feedings and Isaac's infusions (?) don't match up time-wise, so it will be a lot like having a newborn around here for a while. Or else twins-- both on the verge of walking (I'm pretty sure he'll be toddling along after Maren rather than the other way around). I've traded in my former schedule of going to the gym, schlepping Isaac to swimming, and dropping him off at preschool (you know, the mom who is in the car all day long) for driving to doctor's appointments and making sure he gets his medicine. The next week will tell us a lot about how grueling this schedule may be in comparison with the old normal, but I think we'll be able to handle it. We got through the first eleven days-- how hard can the next two months be? In our last installment of the family saga, Isaac was in the hospital, recovering from surgery necessitated by a rare illness. This week, the soap opera of our lives continues. Last Thurday, Annie got a mosquito bite, which, being a kid, she scratched. It got infected. On Saturday, Eddie put her on antibiotics and lanced it to relieve some of the pressure. On Monday morning, my mom took her to the pediatrician, who told her to take Annie to the hospital. She arrived at the hospital at 11am, expecting quick outpatient surgery. She finally got into the ER at 10:30pm. That might not seem like such a big deal, but she couldn't eat or drink anything for all that time, and if you know Annie even a little bit, you can be sure that she got her drama queen thing working and milked it for all it was worth. The upside of already having one kid in the hospital was that we could wait in Isaac's room and didn't have to sit in the waiting room for 12 hours. It was a very quick procedure. I sent her off to the operating room, ran across to the next building to pick up some McDonald's for Eddie and me, and by the time I brought the food to Isaac's room, the surgeon was roaming the halls to let us know how it had gone. He said that his new slogan should be "Dr. M-- faster than McDonald's." Anyway, he said that he's pretty positive she also had MRSA and that there was no way that Eddie could have gotten all of the pus out because it had gone really deep. She's well on the mend-- she has to take a nasty antibiotic three times a day and she needs to bathe frequently, but she went back to school today with a great story to tell. Isaac has been getting better, but very, very slowly. He stopped spiking fevers, stopped sweating profusely, and started being able to eat normally. His bloodwork is slowly returning to normal. Yesterday he had another MRI to see if the doctors had gotten all of the pus in his femur with the first surgery, and unfortunately there was a reaccumulation (I think it's because the antibiotics weren't working full-force yet, so this was pus that got there after the first surgery) so he had another surgery last night. Fortunately, the surgeon was able to use the same incisions and the same hole in the bone. Today, Isaac stretched his leg straight for the first time in nine days, which doesn't seem like a big deal, but it made my day. I think the surgeons are hoping that he'll gain a little bit more range of motion in that leg before they send us home, but it should be just a matter of days now. Best case scenario would be tomorrow, but I think it's likely that we'll stick around until Monday. So what do the next few months look like for us? He'll have physical therapy, but I'm not sure how often. We were able to coordinate with our regular pediatrician to do the follow up visits. We'll have a home health nurse at our house at least once a week. Eddie and I will be giving Isaac IV antibiotics three times a day until Christmas. We're not quite sure how long it will take for him to get mobile again, but we're confident that it will happen. Our family and our ward and the community have all been great. Our neighbor has been taking the kids to and from school. My visiting teachers are driving Maren to and from the hospital so she doesn't have to spend all of her waking hours crawling on the floor of Isaac's hospital room (she took her first steps there today!). Isaac's preschool teachers totally overwhelmed us with hugs and love when I went in on Friday to pull him out of school. My mom and godmother both extended their trips and Eddie's mom is coming to take her shift next week. My sister-in-law in Alaska sent me a beautiful box of chocolate (how did she know I've been practically dying of my chocolate cravings while in the hospital?). Bryce and Annie's teachers made gift bags for all of our kids. It's been hard on the other kids. Maren has been stuck to me like glue, and Annie has perfected the art of the major guilt trip. Bryce has been hanging in there, but I know it's hard on him too. Pretty soon though, Isaac will come home and life will start to get back to normal. Until then, I won't be around so much, but I really appreciate all of your prayers and well-wishes. But you probably wouldn't want to be hanging around me much anyway-- we seem to be under a black cloud and you might get struck with some lightning intended for me or something.